NASA held a press conference this morning to announce their recent research results on the West Antarctic ice shelf. There is one big difference between the Arctic and Antarctic ice shelves: the ice at the North Pole is floating in the ocean, and the Antarctic ice is sitting on land. At a very coarse level what this means is that the melting of the north polar ice won’t raise sea levels (easily confirmed by putting an ice cube in a glass of water and watching what happens to the water level when it melts), but the melting of Antarctic ice will. The story is a little more complicated than that in the Antarctic: where ice meets sea water, the ice gradually melts — and it tends to melt from the bottom up. 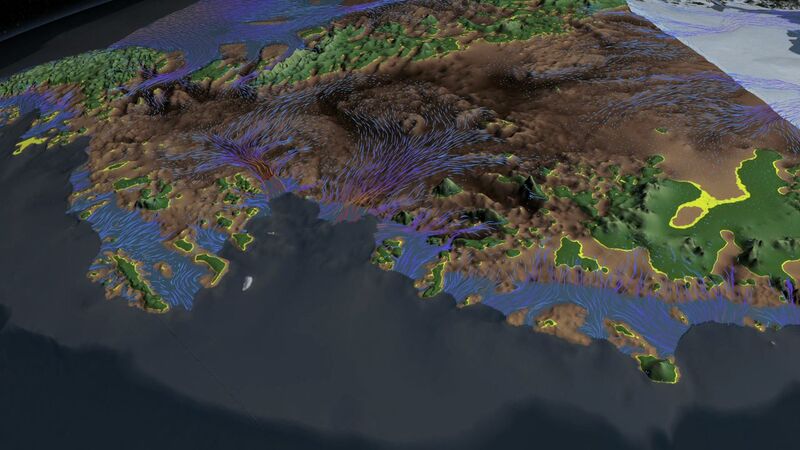 Over time, that tends to undercut the ice shelf, as depicted in this NASA animation. We actually haven’t had good topographical information on the Antarctic continent, but NASA has been working on that and recently has significantly improved the situation. 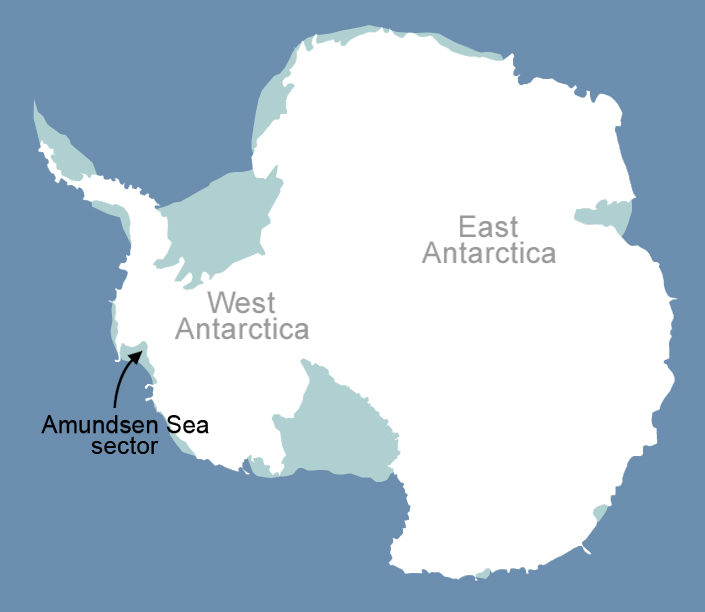 The bad news: we’ve discovered that much of the West Antarctic (and other parts of the continent) is under sea level, and in fact has some deep valleys. without above-sea-level terrain, this is unstoppable. And it’s worse:it’s believed that the glaciers have been stabilizing the rest of the ice shelf, so if they are disappearing faster then the rest of the ice shelf will also destabilize faster. There has been much discussion of late about the IPCC’s recent reports (pdf) of climate change and its effect on sea levels. It turns out that the IPCC projections include only a small contribution from Antarctic ice melt, since they only use published, peer-reviewed research and up to now there has been little hard data (for some of the reasons discussed above). And while today’s report does not add any future projections, it will enable other scientists to do so more accurately, including these folks who partly base their work on the results released today. We should expect that when they do so, the projections of sea level rise will increase. When we talk about climate change, we tend to over-focus on weather over land — for the obvious reason that it’s where we all live. But the scary truth is that what is happening to our oceans is much more dramatic, and will have a huge effect on our ability to live on the land in the decades to come. It’s also happening now, in clear and measurable forms. Here’s the IPCC summary on the changes already happening to ocean systems with projections on what will happen in the future. It’s worth reading the executive summary, even if you tl;dr the rest. It’s very sobering. 90% of the energy from global warming has been absorbed into the oceans; we feel only 10% of in in the atmosphere. We know the oceans are absorbing thermal energy and thus warming. They are also absorbing more CO2, which acidifies them and sets off a whole chain reaction of chemical and biological changes. Ice melt is cooling and freshening some parts of the ocean, while warmer temperatures in other areas mean more evaporation, which increases salinity. There will likely be increased hypoxic (oxygen-depleted) “dead zones” in the planet’s oceans. Biotic production and biodiversity will increase in some areas, and decrease in others. And of course sea levels will rise. These are dramatic changes that will effect the entire planet, and we need to be spending much more time (and money) understanding them and learning how to mitigate the problems we’ve created. Yeah, I know. I’ve been busy.